I absolutely loved Warren St. John’s Outcasts United. I’m not a soccer fan but that didn’t effect my interest in this story of a soccer team composed of refugees relocated to Clarkston, Georgia in the least. St. John’s narrative follows the real life story of a Jordanian woman, Luma Mufleh, who resettles in America permanently after receiving her undergraduate education at Smith College in Massachusetts. Luma finds herself down South just outside of Atlanta, Georgia, in a town called Clarkston where the International Rescue Committee, World Relief, and other resettlement organizations have directed an influx of refugees from the world’s most devastated and war-ravaged nations. The vast majority of these refugees belong to families that have been torn apart by the tragedies taking place in their home countries and are working tirelessly to make ends meet in a nation whose culture fails to understand, and often fails to even attempt to understand, their own. For the youth among the refugee community, however, soccer provides an outlet that most refugee parents are not so lucky to have found. It’s more common in refugee communities to see games of street soccer being played than not, and this is how Luma comes to connect with young men from the whole world over. With bottomless determination and a headstrong attitude, Luma develops a youth soccer league for the refugees. Struggling to find players who will adhere to her strict team rules, safe spaces in which to practice, and proper equipment to outfit her teams are just the first of many obstacles that attempt to thwart Luma’s goal of establishing an organized, empowering, and successful soccer league for the refugee community. But Luma’s endless perseverance meets with numerous rewards and successes, both large and small, that most others in her position would likely never see. St. John’s story isn’t just that of a driven soccer coach, however. Luma’s league is composed of three well-stocked teams, and the players’ stories are just as remarkable as their coach’s. Though her tough-love attitude at first serves to intimidate some players, over time the bond created goes beyond that typical of coaches and players. Luma considers her players and their kin to be her surrogate family, and her kindness and generosity toward them are in keeping with typical family behavior. From helping translate important bills to sorting out financial scams, from filling up empty pantries to coordinating discipline with mothers who can’t be present to keep an eye on their children themselves, Luma runs herself ragged caring for the refugees who become more than simply players on her soccer team. 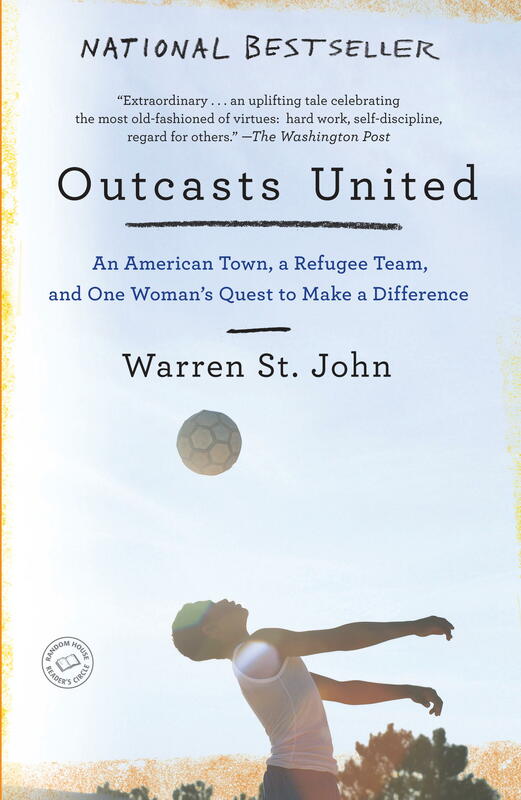 Outcasts United is a story about soccer, relocation, the struggles that refugees face, the extraordinary determination of a single woman, and the unbelievable good that athletics can do. It’s composed of an array of intertwined stories with individual origins centuries old and thousands of miles apart. St. John’s book is at times heart-wrenching, but ultimately inspiring.